Someone at work asked about this trip report I wrote long ago. I had not realized it was ever seen outside Bell Labs Research, but I now know it was. It's a bit of a time capsule now, and I was able resurrect it. Importing into Blogger was a bit of an ordeal that informs some of the points raised here, but other than that I make no comment on the contents beyond apologizing for the tone. This Dorado is MINE, ALL MINE! A recent dig through some old papers uncovered this CERN memo from 1973 describing controls for the Proton Synchrotron being built at the time. I visited the control room some years later and saw the controls in action, installed on a room-hugging curved console reminiscent of a NASA mission control room. I was so impressed by the devices I asked for a copy of the documentation, written by (one assumes) their designers, F. Beck and B. Stumpe. These are like the ur-controls for the iPod and (later) iPhone, but anticipate the music player by almost three decades. In fact, the CERN knob is better than the click wheel: It is programmable to be smooth, indexed, or with variable turning resistance and spring return. It was inspirational to feel how it responded when turned in the various modes. Apple is very good at commercializing ideas, but big research institutions such as CERN, erstwhile Xerox PARC and Bell Labs excel at creating the ideas themselves. The Upspin project uses a custom package, upspin.io/errors, to represent error conditions that arise inside the system. These errors satisfy the standard Go error interface, but are implemented using a custom type, upspin.io/errors.Error, that has properties that have proven valuable to the project. Here we will demonstrate how the package works and how it is used. 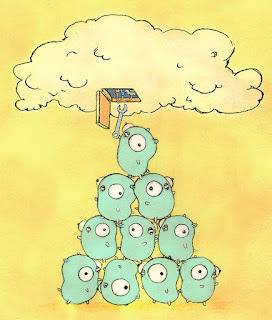 The story holds lessons for the larger discussion of error handling in Go. To make it easy to build informative error messages.To make errors easy to understand for users.To make errors helpful as diagnostics for programmers.